If you get a warning on Windows Vista that a program is trying to access your computer, please allow it to run so it can install the font. After this the font will be installed and you can close the window, and restart your browser or refresh/reload this page to view the text in newly installed font. If you install the font again when new update becomes available, you may need to restart your computer. If you are on Linux or other operating system which also supports OpenType/TrueType fonts, then you can manually download and install the ttf files from here. The zip file contains 3 ttf files. Please follow your operating system instructions on how to install these fonts. Clicking it will install the font. 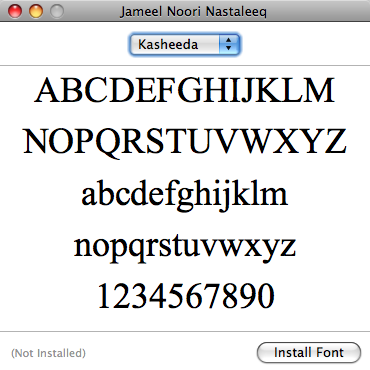 Download and run Urdu Phonetic Keyboard Installer. If you are using Windows XP, you need to follow step 3to enable Unicode Urdu in Windows. Next it will ask you to restart the computer. Select Noat this time. Now to switch between Urdu and English, you can press Alt+Shift. Or on your taskbar you can see EN or UR and click on it to select the language. helping page from your website http://www.urdusukhan.com. i was in search of urdu fonts, thanks a lot. Hey there, just notice your own website through Google, and located that it is truly educational. I’m going to look out for brussels. I will be thankful for people who carry on this later on. Lots of folks will probably be benefited out of your composing. Many thanks ! Simply wish to say your article is as anhsnistiog. The clarity for your post is just great and i could suppose you are knowledgeable on this subject. Well along with your permission allow me to grasp your feed to keep updated with approaching post. Thanks a million and please keep up the gratifying work.